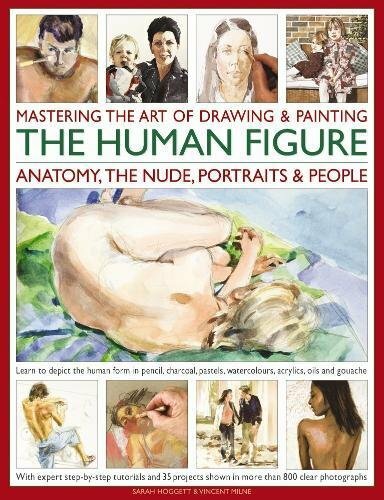 Mastering the Art of Drawing & Painting the Human Figure is another insightful and affordable book from publisher Hermes House. I've featured another one of their books before, Mastering the Art of Watercolour and that was great book. I bought this book under US$11. This is a small, about A5 size, paperback with 256 pages. It's a book for beginners so it assumes no prior knowledge with art. The book talks about the tools you need before diving straight into the tutorials for drawing and painting figures, nudes and portraits. The book covers the use of various media, such as pencil, charcoal, oil, acrylic and watercolour. There are 35 projects included. Through the projects, you'll learn the techniques of foreshortening and perspective, how to capture the form, texture, and mix colours for skin, hair and fabric. The step by step instructions are clear and concise, hence easy to follow. Some examples are really beautiful but some not as good as I expected. But the techniques are sound so it's still worth learning from. I guess for beginners, you won't feel the stress of having to reproduce at the same high standards. The authors are Sarah Hoggett and Vincent Milne. Not all projects are from them. Some are commissioned from other artists. For the price of the book, it packs a lot of knowledge. It's well worth the money. Highly recommended.